Our November/December Issue Is Out! Our November/December issue has been sent to e-subscribers and should be in the mail to print subscribers. The cover story, “Trying Again for Full Employment,” by Gertrude Schaffner Goldberg, is now posted, here; find the table of contents here. The outcome of the midterm elections, with the Democrats capturing the House but not the Senate, means that any promising legislation the Democrats come up with will be largely symbolic. But symbolism is important, especially in the run-up to the 2020 elections, given that many people have been wondering what the Democratic Party stands for these days besides being against Trump. Forcing Republicans to vote against bold and appealing initiatives that meet people’s needs would be good preparation for the next election season. There are lots of issues that could engage voters (and, importantly, non-voters): a federal $15/hour minimum wage, Medicare for All, bold action on climate change. 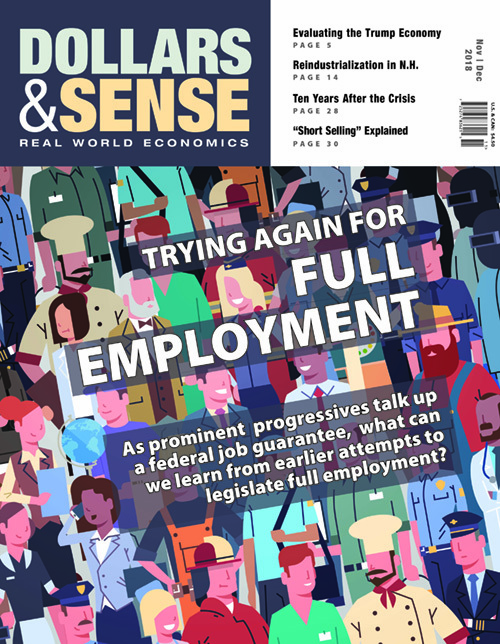 With this issue, Dollars & Sense begins an article series on one promising legislative initiative that could be a centerpiece of a bold social-democratic agenda: a federal job guarantee. In this issue’s cover story, Gertrude Schaffner Goldberg looks at two previous attempts at full-employment legislation, in the 1940s and the 1970s, which initially included an enforceable job guarantee, but dropped it by the time the laws passed. The Democrats should learn the lessons of those earlier efforts and get it right this time. With the talk in the business press about the strength of the Trump economy, you might think that this is the wrong time to talk about full-employment efforts. But as John Miller shows in his column, praise for the Trump economy—whether on employment, wage rates, GDP growth—“is built on half-truths, statistical misdirection, and outright falsehoods.” Millions of people are still out of work even as the unemployment rate has declined. And as Goldberg points out, we should think of a job guarantee the way we think of unemployment insurance: “protection that is always needed but for which the level of need varies” with the business cycle. Come 2020, protection from unemployment may be a much bigger selling point than it is now. Also in this issue: the third and final part of economist Marie Duggan’s series, “Deindustrialization in the Granite State,” draws lessons from a story of reindustrialization with the development of the Diamond Turning Machine; Gerald Friedman gives us a retrospective on the global economy ten years since the financial crisis; plus reviews of books on on radical textile workers and on Basic Income Guarantee (a main alternative to a job guarantee); and more!